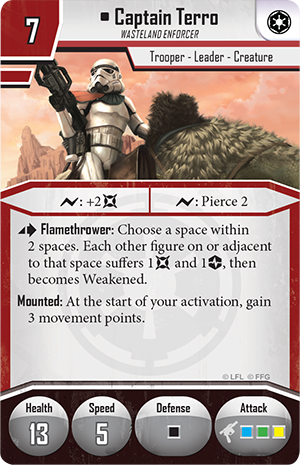 The new figure packs for Star Wars Imperial Assault are a rich harvest. 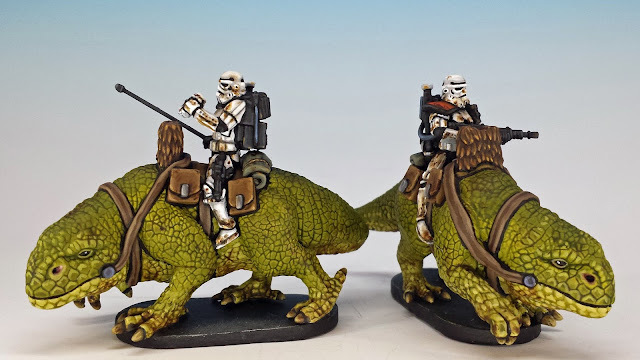 I've already shared some pictures of Luke Skywalker, and now I want to share the others: Jabba the Hutt, Captain Terro, the Dewback Rider and the Alliance Rangers. When I first saw the new miniature for Jabba the Hutt, I was not impressed. His smile seemed moronic and his pose static. But once my washes had disclosed the true topography of his face, I realized that the sculptor (Thomas Sincich) had precisely captured the half-melted malevolence of the Hutt. It just goes to show that it's a mistake to judge a miniature before its painted. "If I told you half the things I've heard about this Jabba the Hutt, you'd probably short-circuit." 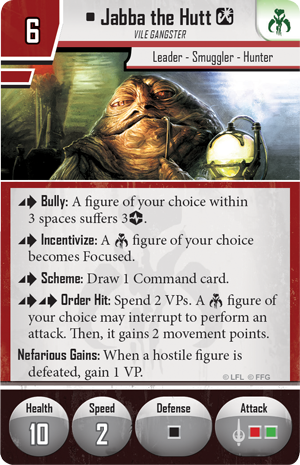 Jabba is also a game-changer for the skirmish version of Imperial Assault. Appropriately, he will rarely enter combat (in fact, he will rarely move) but by squatting in the rear he can hatch plans, terrorize his underlings and order hits on his opponents. Once again, the IA rule makers (Daniel Lovat Clark, Todd Michlitsch and Paul Winchester) have done a splendid job of capturing the essential flavour of the personalities that they bring into the game. Dewbacks, of course, are the great reptilian mounts that we see briefly in A New Hope when the Empire is hunting for the droids (Here is an interesting documentary on the making of these creatures). 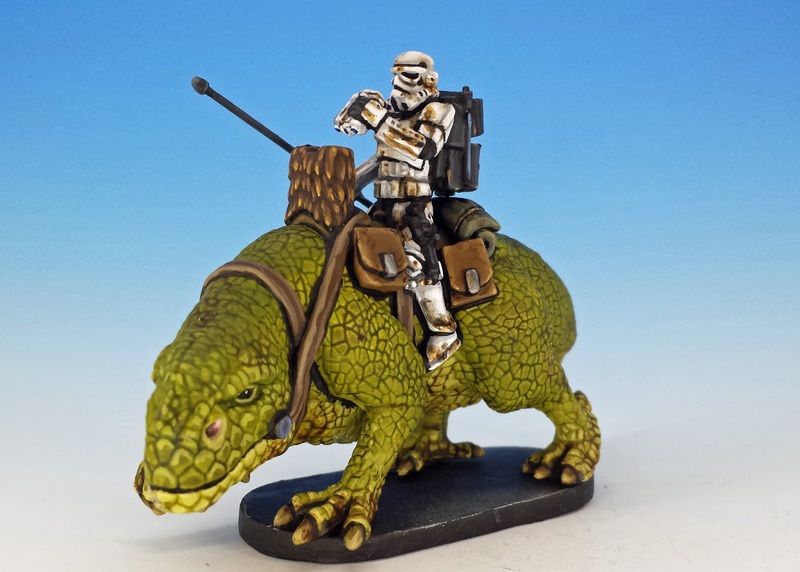 Fantasy Flight Games released one Dewback pack with two different potential riders: Captain Terro (carrying a flamethrower) or a generic Dewback Rider (carrying a shock lance, like the mounted trooper in Episode IV). You can see both version in the photo above, with Captain Terro on the right. True to the cinematic originals, I decided to make my riders dirty and battleworn (mainly with the help of oil paint and white spirit). I also spend a lot of time trying to get the colours right on their backpacks, which were sculpted by Dave Ferreira with a great attention to authentic detail. 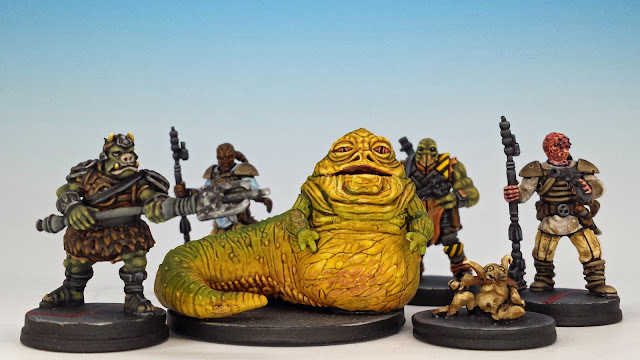 As with Jabba the Hutt (or the Rancor), I tried to create a sense of life in the Dewback by employing glazes of oil paint and white spirit to deepen the skin tones. Getting better and braver in my use of oils is one of my primary goals for 2017 (That and returning some library books that I borrowed in 2016). And finally we have the Alliance Rangers -- special ops forces of the sort we met in Return of the Jedi on the moon of Endor. 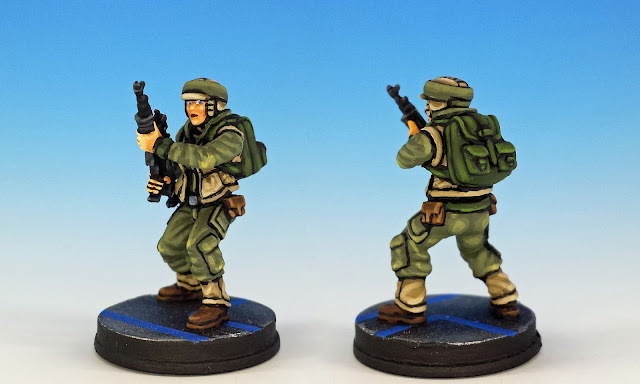 As far as I know, these are the first rank-and-file soldiers in Imperial Assault that are female. Well, you should have a healthy respect for their grrl power. I recently played a great skirmish game at For the Win Cafe in Toronto (some people are starting a friendly biweekly skirmish group there) and these Alliance Rangers shot me all to hell. Hell yeah! Great job on these! I really love those Dewbacks! The Dewbacks are a thing of beauty! 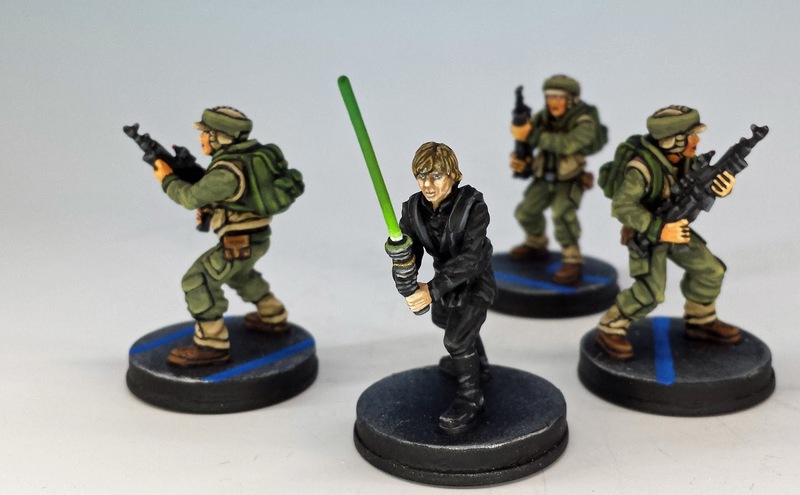 What a awesome painted miniatures! You did it again. Masterclass. These are actually gorgeous. The dewbacks in particular have nice gradients. I'll be keen to pick your brain on oil washes. Dewbacks are stunning, excellent job! Splendid painting! I especially like how Jabba and dewbacks turned out! 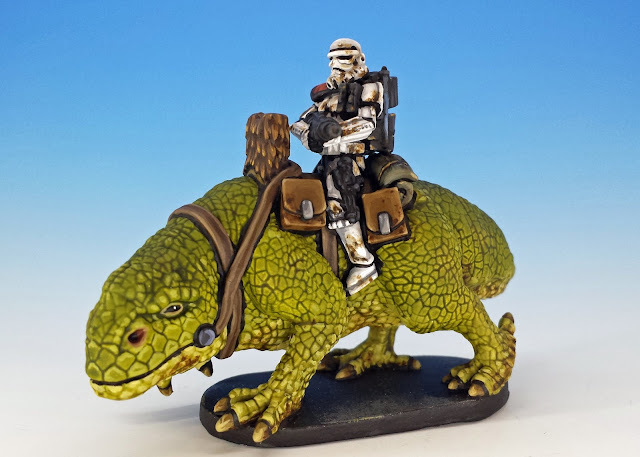 Wow- I'm painting my dewbacks now and I'm so intimidated by your amazing work! Still loving your work on these. Thanks for the feedback, everyone! I'm glad you're enjoying this Star Wars jag of mine. Those look outstanding! Well done. They're all terrific but the dewbacks are real standouts. Great job. The Endor Commandos (Alliance Rangers now apparently) uniform was always my fav Alliance uniform. When I'd dallied in the 501st SW costuming lark as a Biker Scout, I'd always dreamt of my 2nd SW costume being an Endor Commando like the ones in RotJ. 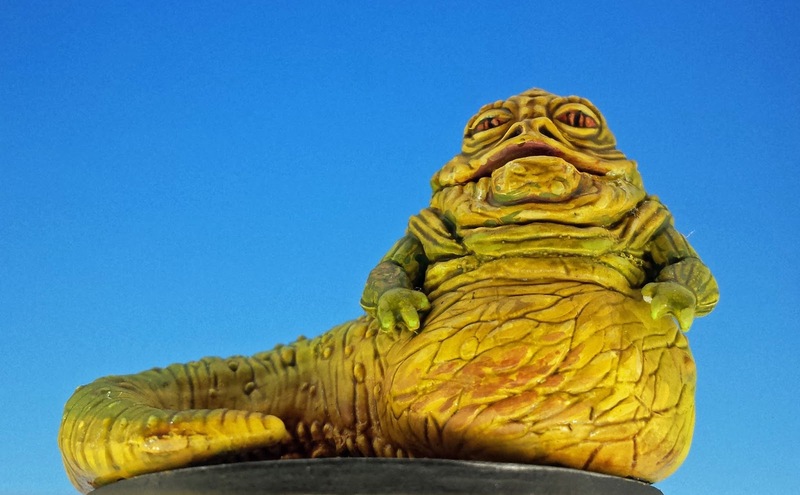 Been waiting patiently to see your Jabba and I am not disappointed mate. He looks right out of the cartoons or comics. (I don't think that the sculpt is accurate enough to the RotJ images though.) Perhaps a little green spittle ozzing out of one side of his mouth would be my only suggestion, though it's by far not at all necessary. The Dewback and riders are stirling! 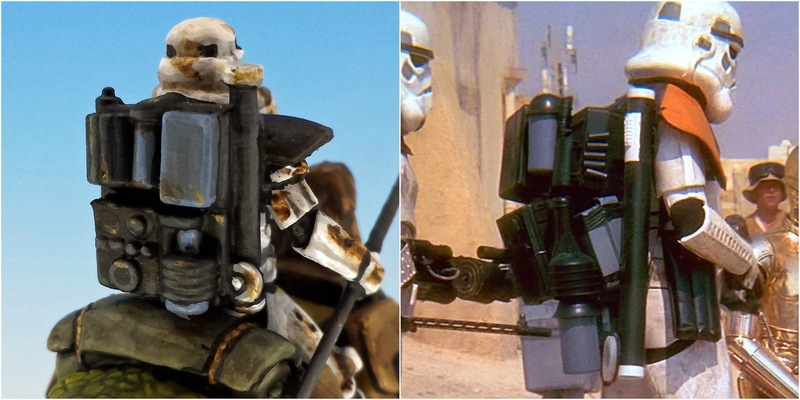 Getting a Sandtrooper to look "right" is not easy and you've done just that with bells on. Bravo.